It’s hard to imagine a cooler pet than a lizard. Mammals are easier to relate to; the pack-driven social nature of the dog makes sense to us on a subconscious level, and you either are a member of the cat-worshipping society or you aren’t. But from their scales and claws to their frills and spikes, lizards scream alien, different from us. So, before you buy the first three reptiles you see and pretend to be Daenerys, Queen of Dragons, it makes a lot of sense to research the best lizards for beginners. Because reptiles and amphibians are so different, they require a lot of specific conditions that aren’t automatically obvious to us. When something is both very cool and difficult to understand, the result is usually messy. Many new reptile owners find out too late that they aren’t ready to properly care for their new pets, leading to unhappy owners and many unfortunately deceased reptiles. Even the best lizards for beginners come with some important considerations. Before you start picking your new pet, there is some general information about reptiles that you should be aware of. Legality: Many places have laws against keeping certain kinds of reptiles as pets. You should always make sure you are legally permitted to have a type of lizard or snake before you buy one. Health risks: There is a risk of salmonella infection from reptiles and amphibians. It can be transferred through direct contact, and indirectly through droppings. 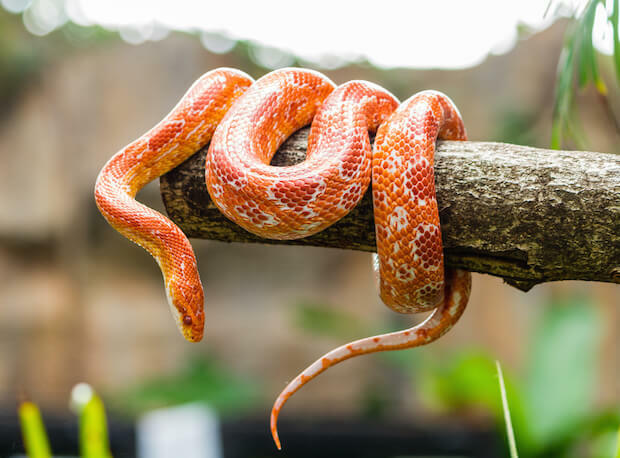 If you have children or people over the age of 65 in your home, the CDC suggests that you avoid reptiles as pets, and you should always take care to avoid contamination regardless of age. Heat and light: As warm-blooded creatures, we are largely indifferent to the temperature until it hits extreme levels. Cold-blooded creatures are a different story; their life is defined by temperature and light. Managing and maintaining these factors is one of the biggest parts of caring for reptiles. Be sure to know the light and temperature requirements before you make a purchase! Captive bred: By choosing captive bred reptiles and amphibians, you're getting pets that are familiar with terrarium life, minimizing stress. Captive bred animals are raised and sold legally, are typically healthier, and aren’t gathered from the environment where their capture reduces the natural population. Mixing species: Much like the fish in an aquarium, there are a lot of factors to consider when you want to keep more than one species together. They may need different environmental conditions, or you may run into problems with aggression. The truth is most terrariums aren’t large enough to support a complex ecosystem with multiple types of reptiles! It is not recommended that geckos be kept with other species. There is great danger of illnesses being passed between them, and of bullying/fights occurring. The only suitable companion for your gecko would be a female gecko. If you choose to get one, it's best to quarantine the new gecko in a separate room for at least 30 days to be sure it's healthy. If you aren’t intimidated about the responsibility you are taking on and the necessity of washing your hands after handling your pet, cleaning its cage, or feeding it, then it’s time to start thinking about which reptile to buy. Brace yourself before you walk into the pet store. When you see rows of attractive lizards, snakes and turtles, it's easy to get enthusiastic and get your heart set on one species. But just because the store is selling them doesn’t mean they're the best lizards for beginners. Care requirements: Some species have very specific lighting, temperature and dietary requirements that are difficult to maintain, while others are more flexible. Size: Some lizards, such as iguanas, can grow to a size that’s difficult to manage. Be sure you're ready to manage the adult size of your pet! Aggression: Some species can be very aggressive, and this can be a problem if you want a closer connection with your pet. Resilience: In addition to environmental concerns, some reptiles are more resistant to stress and are hardy. These will be much easier to take care of while you are learning. Handling: Some species are comfortable with being handled, while others are only meant to be enjoyed visually. Many of the coolest looking reptiles aren’t the best reptile pets for handling. By choosing your pet based on the traits you want, you will have much better chances of success. If you are a beginner, some species will be easier to care for. 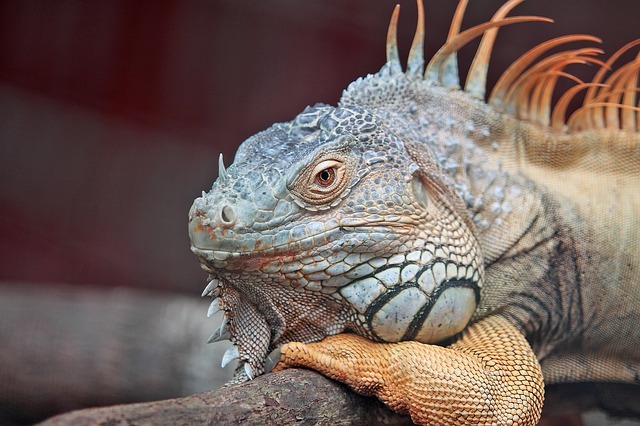 Beginners should avoid choosing iguanas for their size and aggression, and chameleons for their specific care requirements and low stress resistance. Venomous snakes and constrictors should be left for more experienced snake owners. Turtles aren’t typically a good choice for beginners, because they tend to be tricky to care for, live a long time, and grow very large. They represent a commitment that you don’t want to make lightly. Regardless of the type of reptile or amphibian that you choose, you'll need to do a lot of work to get ready for your pet. The more knowledge you start with, the better your pet reptile experience will be! Before you bring home your new pet, you will have to get yourself set up to care for it. Terrariums: It’s important to pick the right terrarium for your reptile, taking into account the size, behavior and environmental needs of your pet. A large lizard needs a large tank, while a climbing lizard will need a tall terrarium with a climbing stick. Make sure the tank is escape-proof and placed in an area where it won’t be exposed to drafts. Heat source: Unless you live in the same environment as your reptile, you'll probably need a heat source in your terrarium. This can take the form of a basking light, a ceramic element or an under-tank heater. Make sure you have a thermometer to measure the temperature, and avoid heat rocks, as they heat unevenly, and can injure reptiles basking on them. Lighting: To light the terrarium, you will need to use either full-spectrum incandescent or full-spectrum fluorescent lights. Research the species of your pet to be sure you're choosing the correct light source. Feeding: Although each species will be different and have its own diet and feeding requirements, there are some guidelines. 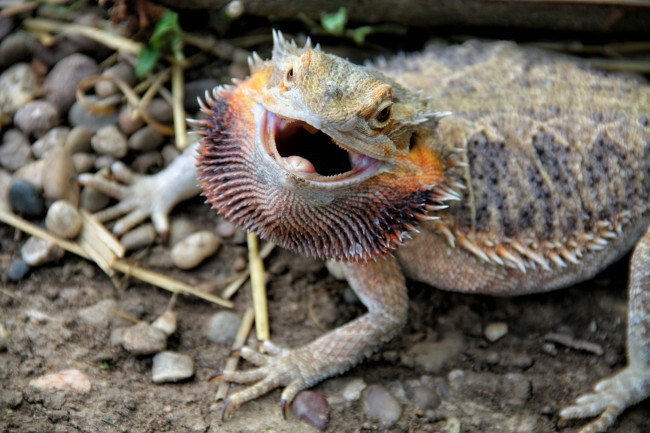 Reptiles can be carnivorous, herbivorous, or omnivorous, so you could be feeding your new pet anything from lettuce to crickets and mealworms, to live mice. As a general guideline, feed amphibians daily, and skip a feeding every few days for reptiles. Snakes that eat live rodents only need to be fed once a week. Cleaning: Your terrarium will need to be cleaned each week, and make sure that everything placed in the terrarium is clean and disinfected, including food dishes, floor covering, and décor. You can use chlorine- and alcohol-based cleaners to do this, but make sure they're rinsed thoroughly. Compared to other animals, reptile pets are ideal in many ways, with little noise or odor, and requiring little cleaning, feeding, and maintenance once their environment is set up correctly. As always, it's crucial to research your pet to make sure you know the exact care requirements! Appearance: Darkening skin, color changes and other kinds of changes in appearance are warning signs for reptiles. Also watch for lumps, scabs or infections. Feeding habits: If your pet changes its diet, or slowed or even stopped eating, this could be a warning sign of a problem. Behavior: If the reptile is changing behavior, such as seeking or avoiding heat or water, shedding at strange times, basking with its mouth gaping, or just generally being lethargic, you should be paying attention. Like a parent with a new child, you'll quickly learn to recognize your pet reptile in its natural and comfortable state, and you will see when something is wrong. Even the most experienced pet owners will run into situations from time to time. The best lizards for beginners will still leave you scratching your head and wondering what to do about a specific situation. This is when having your reptile veterinary questions answered quickly by an Expert on JustAnswer can be the most valuable; when something isn’t right with your pet reptile, you don’t need to run to the emergency room or wait for a vet visit!